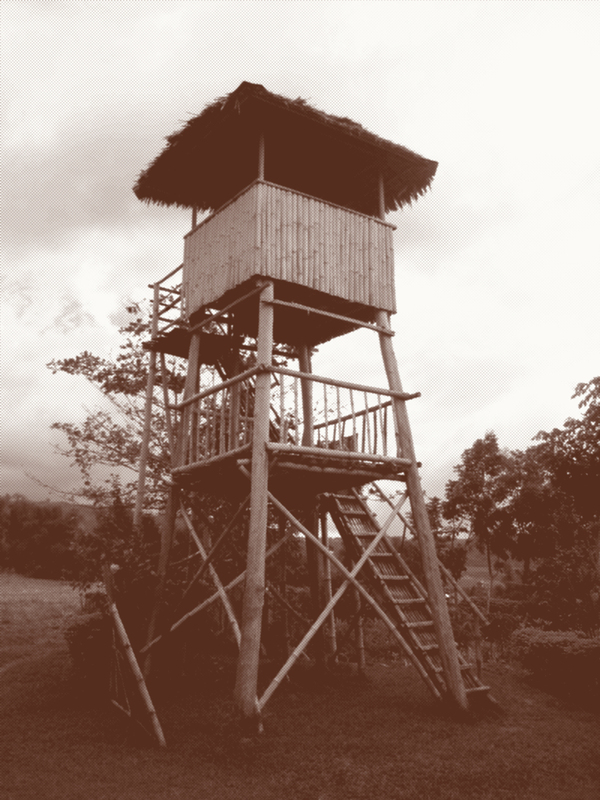 ← Santo Tomas Internees Liberated 70 years ago. 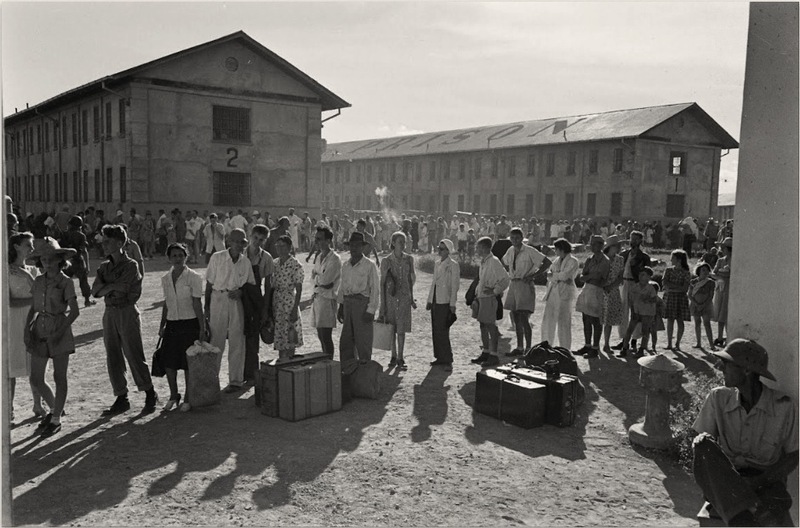 In addition to the Santo Tomas Internment Camp, internees were held at other camps such as Baguio, Davao, Bilibid and the Los Baños Camp. In commemoration of the liberation of the Los Baños Camp on February 23rd, 1945, I dedicate this article and offer these direct quotes from those who were there. I am authorized by the Director-General of the Japanese Military Administration in the Philippines to make a statement regarding the change of location of enemy civilian’s internment camp. As all of you are well aware, released enemy nationals in the city of Manila are more than 2,000. Most of them, being unemployed, are in extreme difficulties in their living, and the number of applicants for internment is daily increasing. 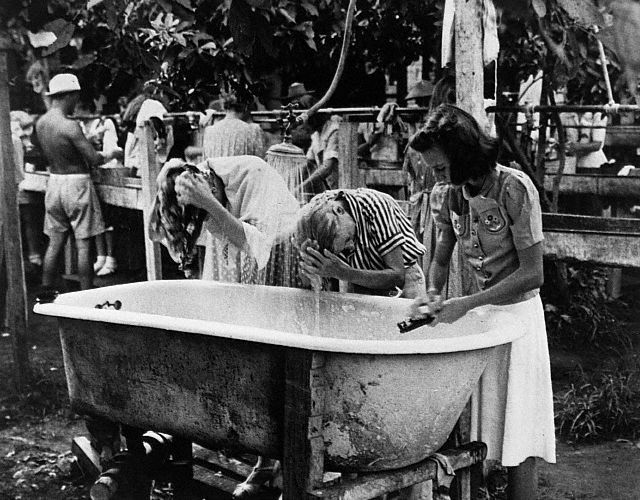 It is, however, to be pointed out that the present accommodations available in the Santo Tomas Internment Camp is not sufficient to have all of them interned there, and particularly so from sanitary point of view. In consideration of these facts, the [Japanese] Military Authorities here have come to a decision, to change the location of the internment camp to a more spacious place where more permanent accommodations can be provided so that you will continue to live there until the time when you will repatriate to your respective countries or peace will be restored. 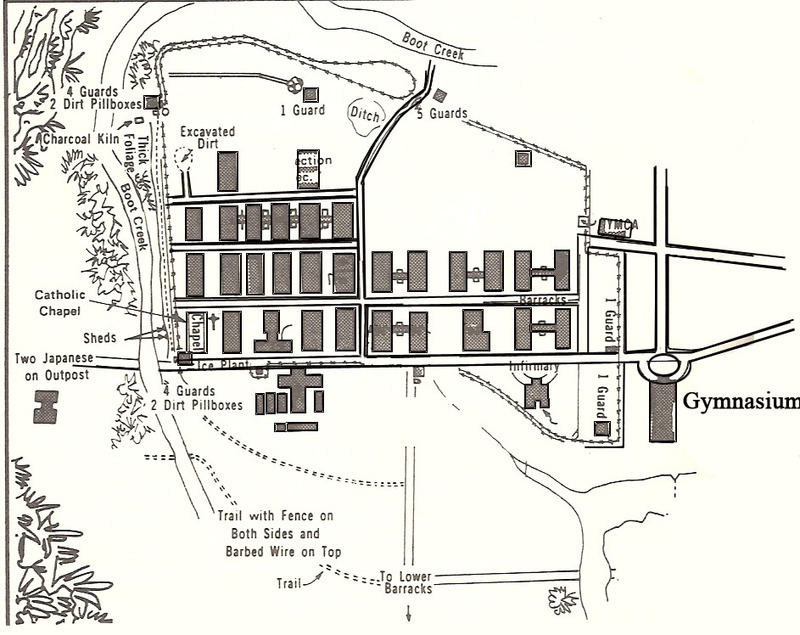 Map of the Los Baños camp drawn by internee Pete Miles who smuggled it out to guerillas several days before the raid. 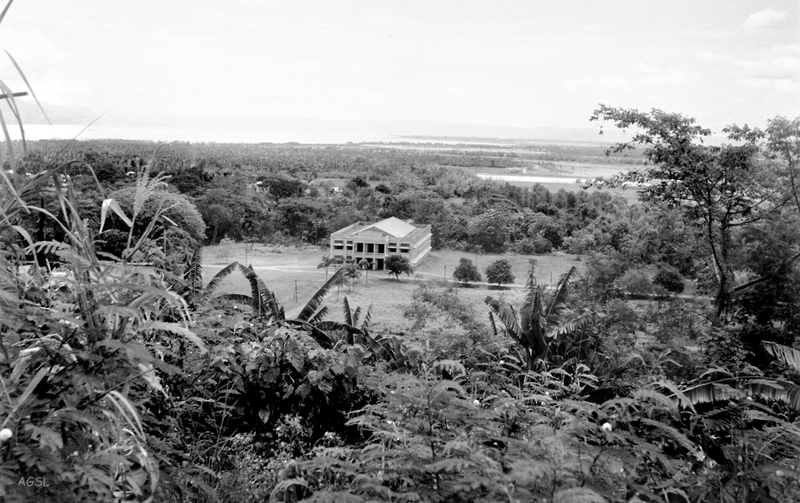 The Los Baños Camp was located on the grounds of the College of Agriculture and Forestry of the University of the Philippines, a rural facility by Laguna de Bay. A fence of double ring of barbed wire encircled the original 25 acres consisting of faculty housing, scattered cottage type classrooms, and a gymnasium. 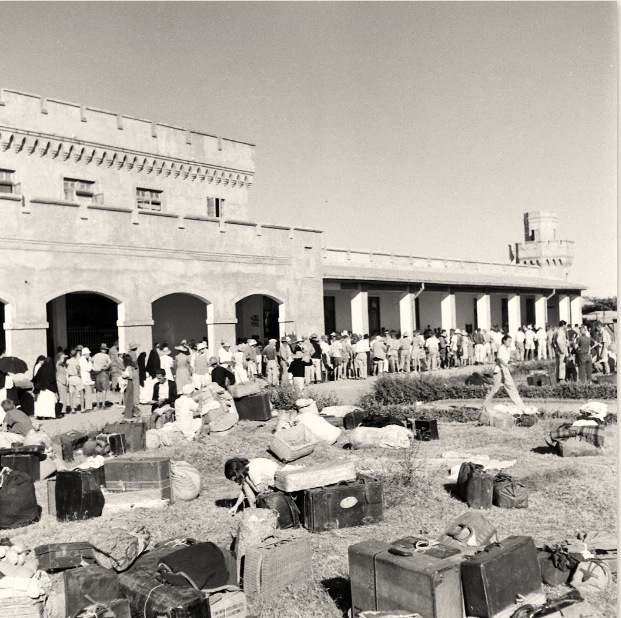 The first POW’s to arrive moved into the various buildings with the Japanese Garrison troops housed adjacent to the main gate. The “able-bodied” male internees themselves were charged to construct their own barracks, floors and plumbing for showers and drinking water. Jerry Sams was one of the “able-bodied” men who was transferred from Santo Tomas to Los Baños. He met his future wife, Margaret, during internment. 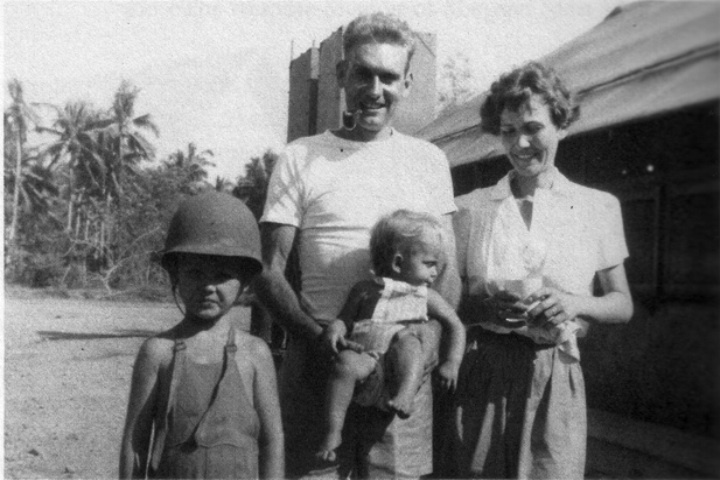 She and her son David were sent to camp as her husband Bob fought the invasion from Bataan. He was captured, forced into the Bataan Death March and later died on a hell ship enroute to Japan. Stranded and alone, Jerry and Margaret formed an intimate bond during internment. Their subsequent marriage after liberation lasted until they both passed away just several years ago. Jerry Sams at Los Baños taken with his smuggled camera. Jerry and Margaret Sams with children David and infant Gerry Ann. Konishi was despised by the internees. A small, arrogant and brutal man with an intense hatred for the white race and the Americans in particular. He vowed at one point that the internees would be “eating dirt before he was through with them”. This is what the internees would have to contend with for the next year and eight months. For the most part it could be considered a self-governed prison village. Similar to the organization of the Santo Tomas camp, the internees formed an Executive Committee to act as liaison with the Japanese Commandant in charge of the Camp. 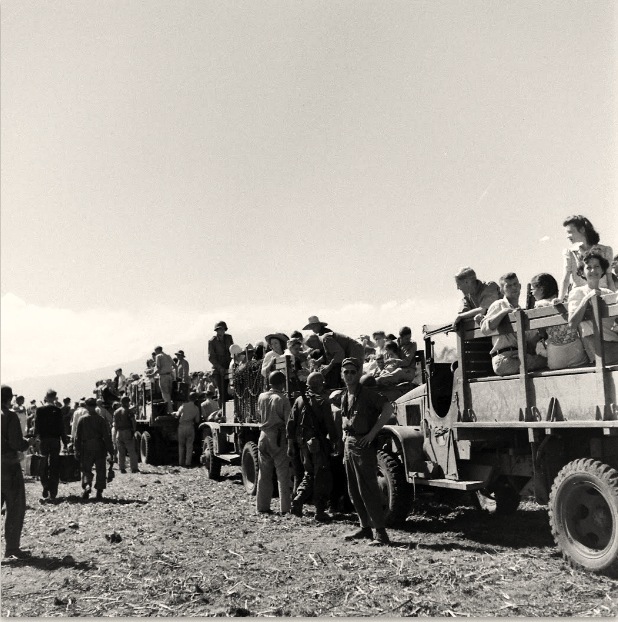 In the summer of 1944, three hundred Catholic priests, seminarians and sisters under Bishop Jurgens and clergy of all denominations were rounded up and transferred to the camp. 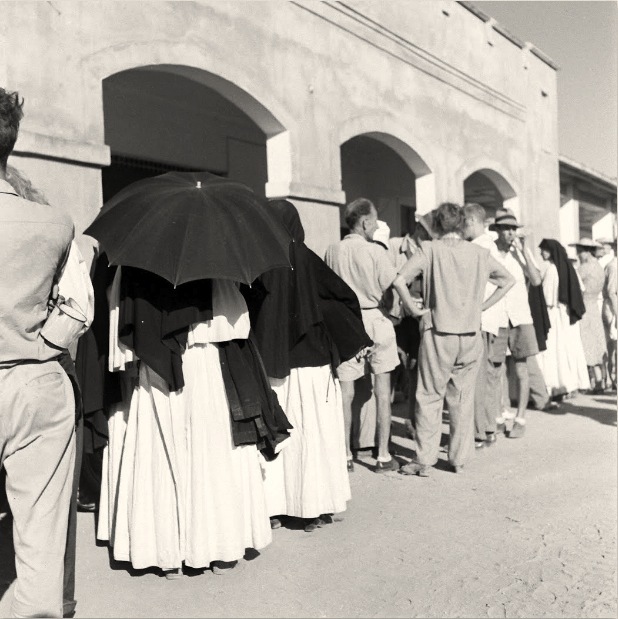 Separated from the more than 1,500 lay internees, their part of the camp was dubbed “Vatican City” while the lower half was “Hell’s Half-Acre.” There were more than 130 Masses offered daily in the makeshift chapel. 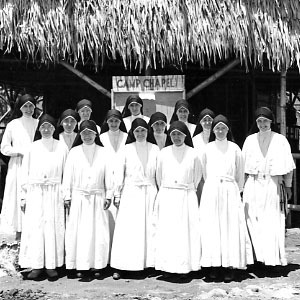 Sister Miriam Thomas was among over 50 Maryknoll sisters interned. She was studying for her doctorate as World War II broke out and she and the other Sisters were later brought into the prison camp. Sister Thomas brought along her books and painting materials, and despite the hardships and the weakness she experienced from the starvation diet in the camp, Sister was able to finish writing her doctoral dissertation. She even designed a holy card for others in the camp. In early January, the internees at Los Baños started seeing a large number of American planes flying overhead. Their Japanese guards seemed listless and anxious and even lax guarding their charges. On January 5th, the Japanese left, leaving the Executive Committee in charge. The whole camp exuded utter elation as their captors left. They renamed it “Camp Freedom” and divided the food supplies amongst everyone. Their elation quickly ended as the Japs returned on January 13th. The Japanese had lost face as a result of their quick departure and now commanded the internees with furious vengeance. Elation was replaced by a state of hopelessness once again. Oddly, the rescue of Santo Tomas internees on February 3rd would not be announced on the Voice of Freedom until the end of the month, leaving the Los Baños camp completely unaware of their fellow internees’ freedom. The following vivid account of the liberation of camp is told here by Alex Morley USAF Pilot during WWII. 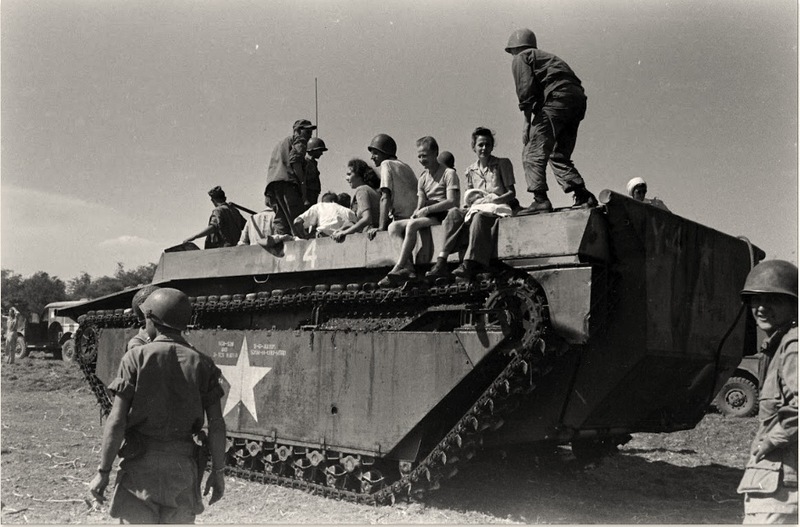 We were to be joined by 150 Paratroopers from the 11th Airborne Division for a surprise rescue raid on the Los Baños concentration camp on the grounds of the former University of the Philippines Agricultural School on Laguna de Bay about 40 miles southeast of Manila. 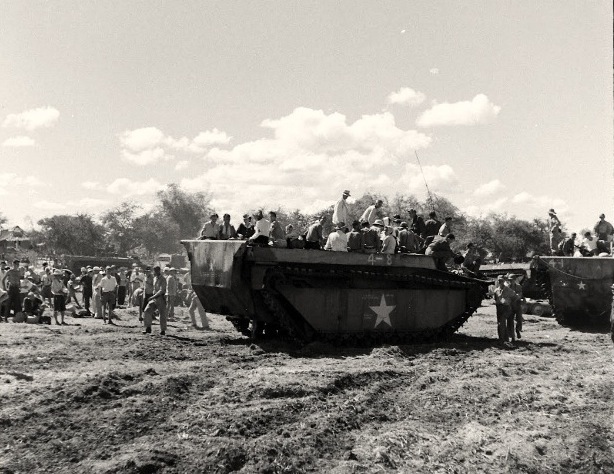 Joining in the attack would be the 672nd Amphibian Tractor Battalion who would approach the camp across a lake in 54 “Amtracs”—amphibious tractors. The raid had to be precisely timed and coordinated. The Filipino scouts had told us that the Japanese troops guarding the camp always went for morning calisthenics at the same time and at the same place, stacking their rifles together while exercising. 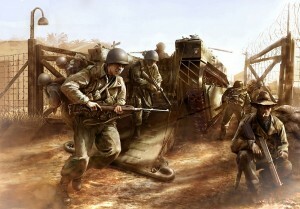 We were to drop the Paratroopers at the precise time when the Japanese were disarmed. At the same time the amphibious troops were to attack by water and land. We hit the drop zone at the exact second scheduled. I could see the Japanese troops in the yard of the camp, exercising. We were at only 400 feet elevation and the Paratroopers barely got their parachutes open before they were on the ground. The Japanese were caught completely by surprise. 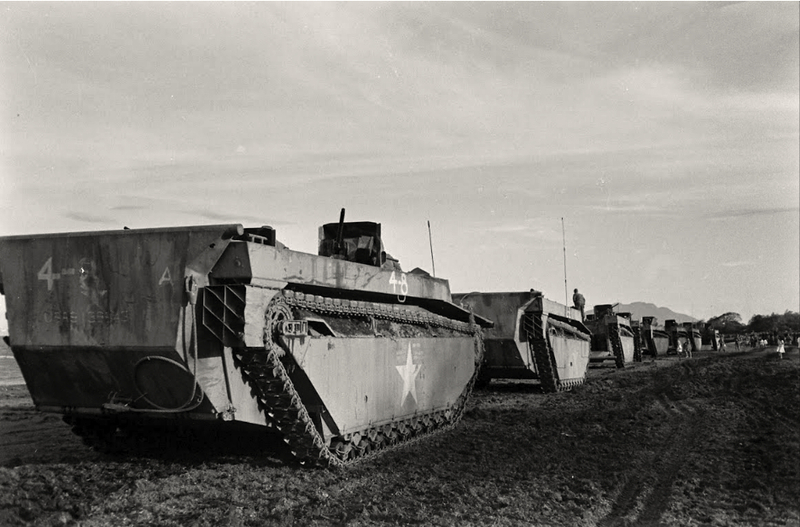 At the same time the amphibious amtracs approached from the lake shore and the ground troops joined the battle. I broke formation and circled around while the rest of the Squadron left. From the air we could see the Japanese troops in panic, but starting to fight back. We circled around and around the concentration camp and had a perfect view of the fighting that at times seemed very fierce. 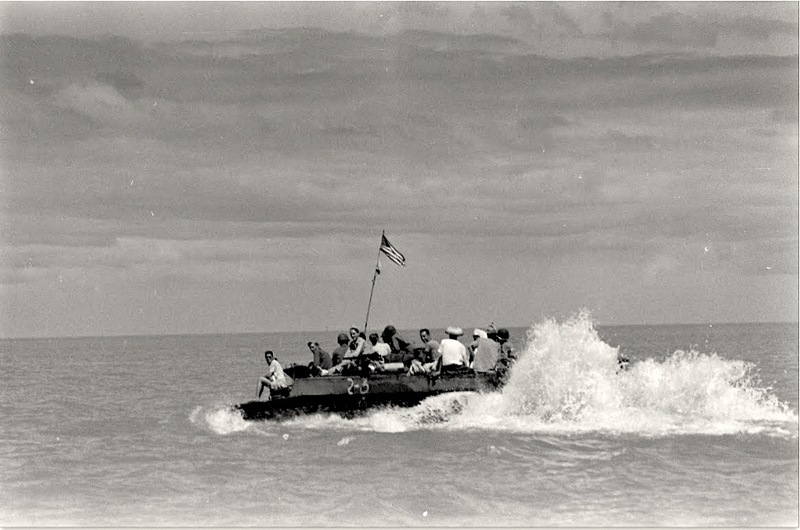 The Japanese never fired on me that I was aware of; they were too busy with the paratroopers and the amphibious forces. Guerrilla troops were all over the place. They seemed to rise out of the ground and I can vouch for the fact that they showed no mercy. 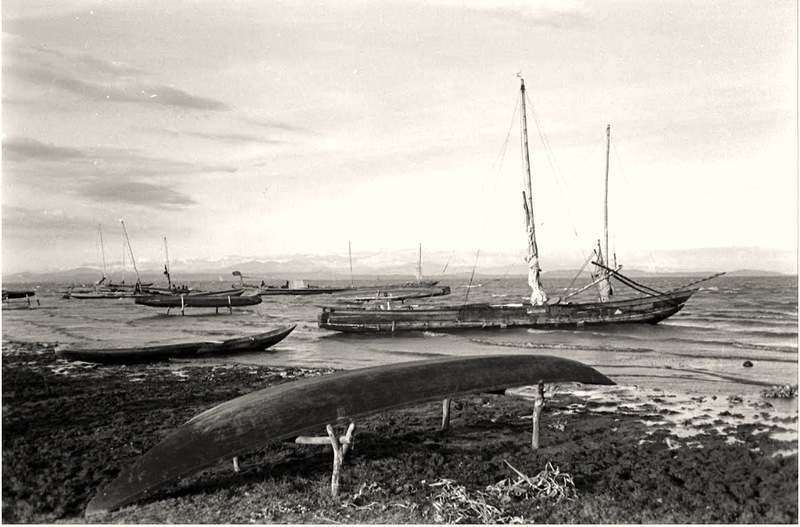 In addition to rifles they all carried bolos (long heavy knives) the beloved weapon of the Filipino, and any Japanese they shot, they made sure with their bolos that he had gone to meet his ancestors. It was a pretty piece of work and lasted about 15 minutes in which time the entire Commandants Staff, including the Commandant himself, were accounted for and the Barracks set afire over them. No prisoners were taken, and I may say that remark applies to whole operation against the Camp. 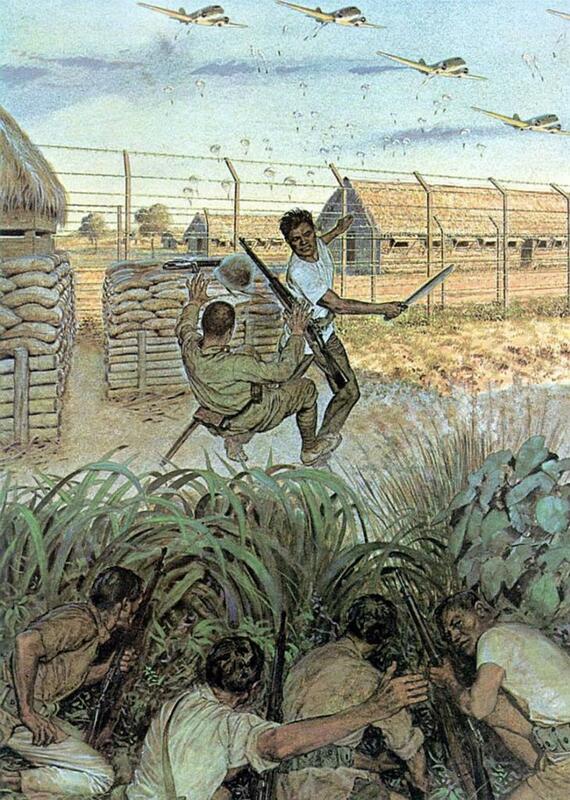 The Filipino guerrillas don’t take prisoners, not because the Japanese fight to the last man as Japanese propaganda would have us believe, but because they have a long score to settle with the Japanese. 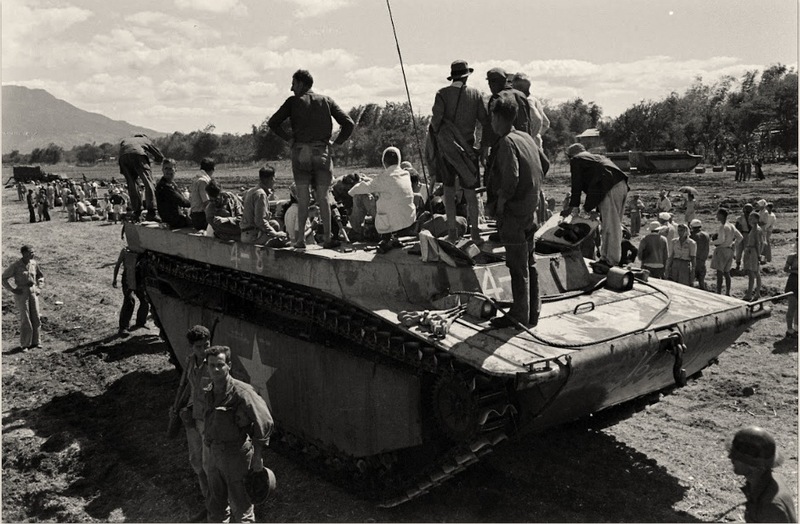 The entire Camp was completely evacuated by 8:45 a.m. and the long string of tanks was crashing along to the lake. We were fired on once en route to the lake by a few snipers in the trees on the road side. 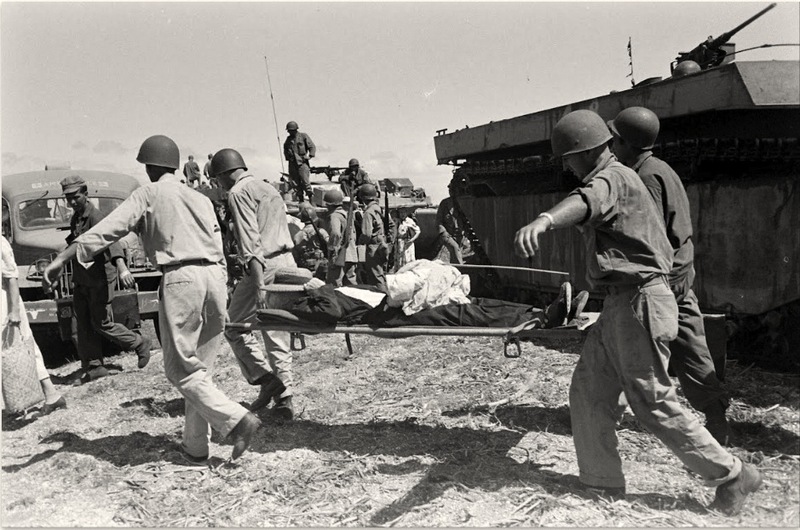 One internee was wounded but a burst from one of our machine guns and from a couple of tanks immediately ahead, seemed to deal with the situation. From the beach at Cabuyo we were taken in ambulance and trucks to Muntinlupa, formerly a large prison now used as a base hospital by the American Army. As soon as we arrived we were given hot soup and a light meal. What a joy it was. Our troubles were at an end. [source: Journal by Lewis Thomas Watty, vice president of the POW committee. Many of the internees were still in shock, sickly or too weak to move. Some were hesitant to leave without their meager belongings. A few barracks were set ablaze by the Japanese. American Maj. Burgess seized on the burning barracks as the answer to the question of how to hurry the internees to avoid any oncoming Japanese. He told his men to go to the south side of the camp and torch the remaining barracks. As they were being evacuated, Jerry Sams took this photo. 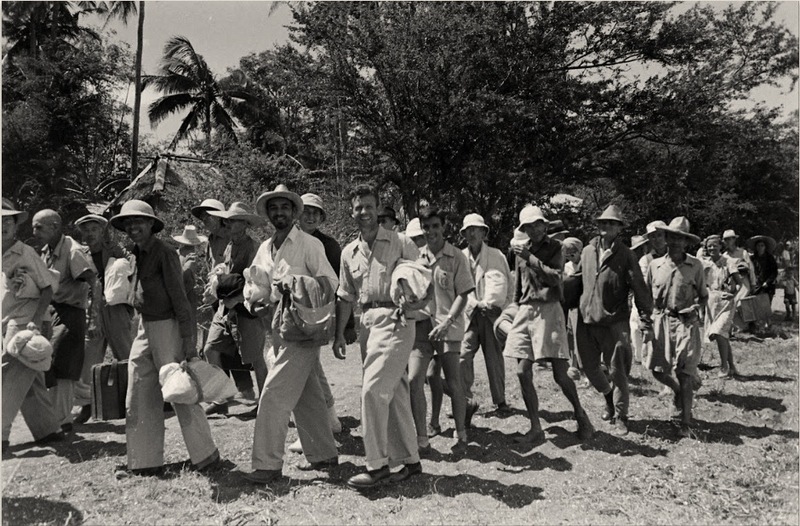 Jerry Sams evacuates camp with daughter Gerry Ann on his shoulders. 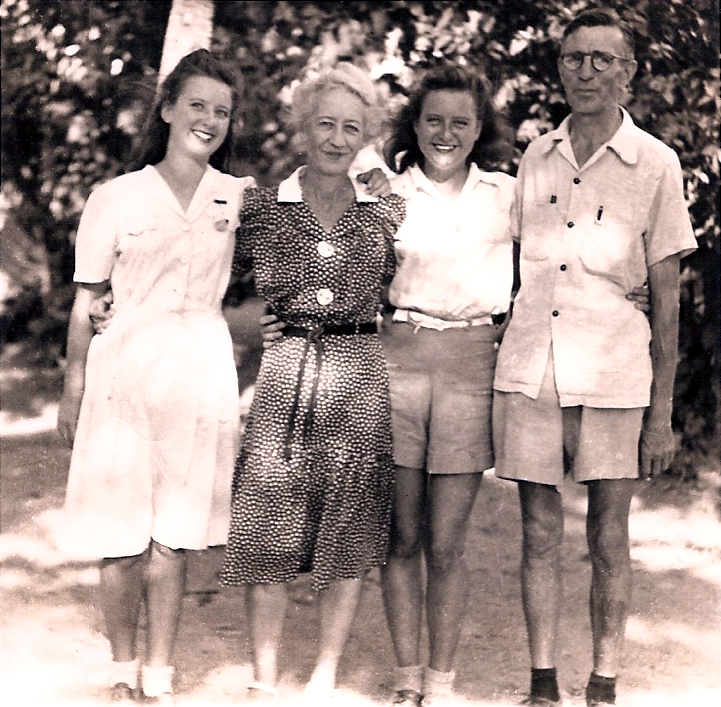 Margaret Whitaker was interned at Santo Tomas with her family when they were directed to move to the Los Baños Camp. Here’s a photo of Margaret while at Santo Tomas. She is the young teen on the right with the ladies washing their hair. Konishi, along with about a hundred other Japanese troops, survived the raid by hiding in the jungle surrounding the camp. 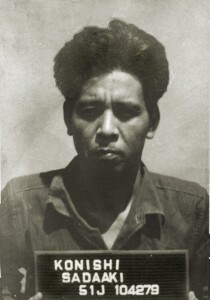 Above, a photo of William H.Donald, famed journalist who wrote anti-Japanese articles while in China and was highly sought after by the Japanese who had unknowingly held him within both the Santo Tomas and Los Baños camps. He is being interviewed at liberation with his secretary Ansi Lee (photo by Jerry Sams). 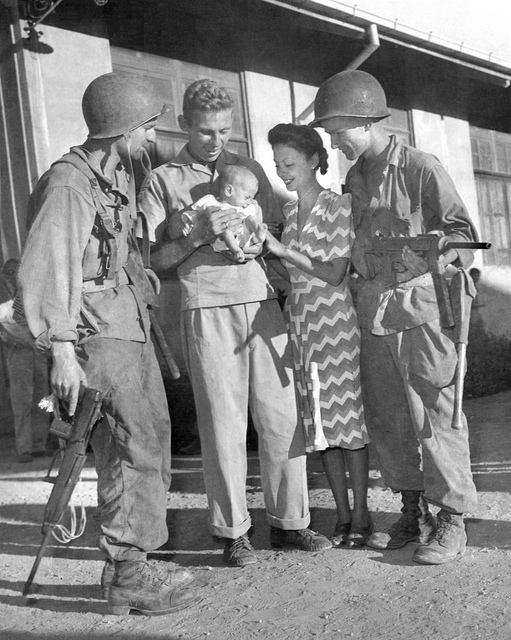 Margaret Whitaker Squires was 18 when she was liberated from Los Baños. Coincidentally, she met her husband Martin Squires, who was one of the camp’s liberators, in Bellingham a few years later. They were married for 52 years before he passed away. 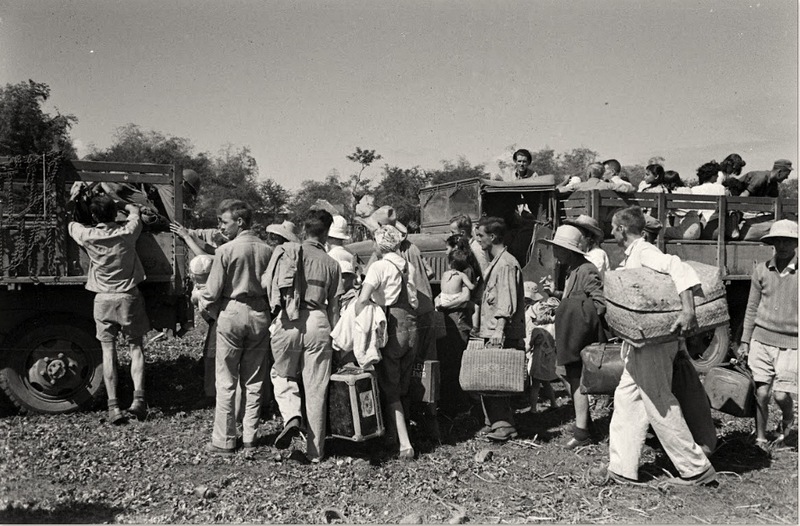 Arriving at Muntinlupa, the internees were registered and billeted. The process of repatriation had begun but first, they needed nourishment. 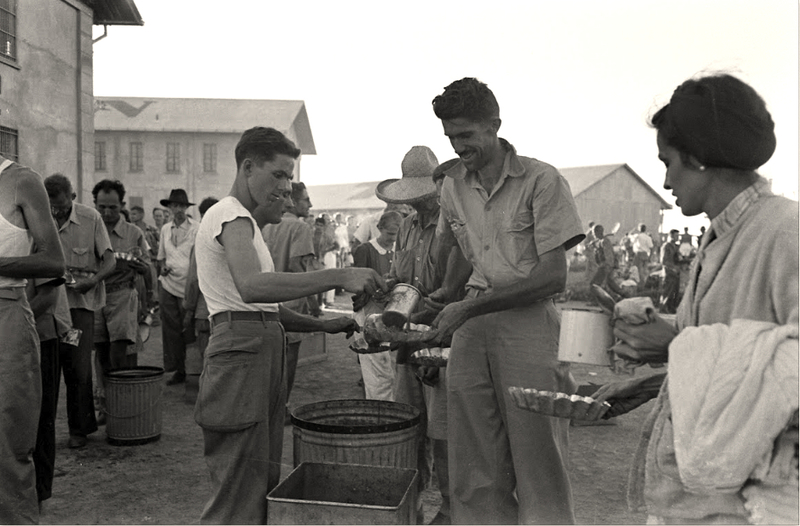 After the long months of internment and near starvation, the Army was careful to provide food that would not be too rich but would adequately provide for regaining their strength. Lining up to register. Margo Tonkin is under the 2 with white dress. The internees were processed individually. Lea Bowie sent me these rare documents showing the medical clearance documents and ticket stubs indicating which truck on which they would be evacuated. Infant Lea Bowie and mother, Francesca Bowie truck evacuation tickets. Los Baños peaceful scene would soon turn into a tragedy. Note: Sadaaki Konishi was eventually captured and assigned to a group of POWs to clean up rubble around Manila. 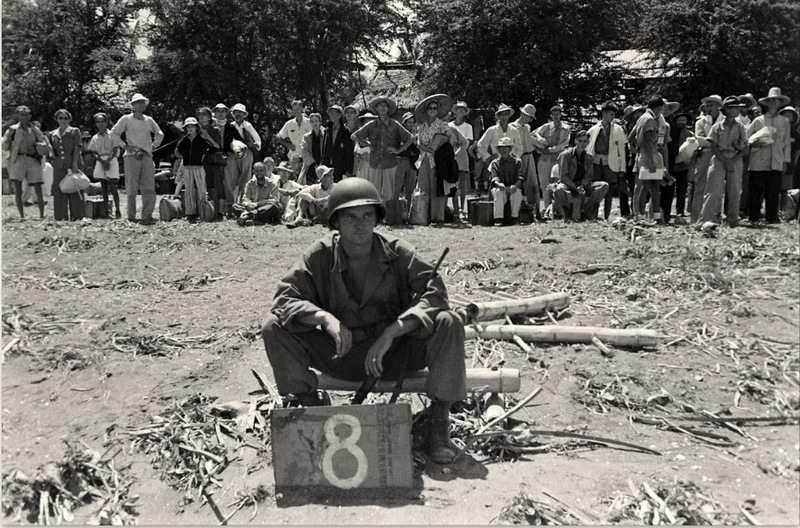 As luck would have it, he was recognized by one of the Los Baños internees at the Wack Wack Golf Club in Manila in July 1945. Konishi was tried as a Class C war criminal for the offenses of violating the laws of war. He fully admitted to the massacre of thousands of civilians and added that “he had been conducting a war and left such mere details to his staff.” He was hanged in Sugamo Prison April 30, 1949. A Maryknoll nun, Sister Theresa, later reported that shortly before his death, Konishi became a convert to Christianity. My respect and compassion goes out to the internees and the Filipinos who suffered great loss during this horrible ordeal. Thanks to Margaret and Jerry Sams, Margaret Whitaker Squires, Ansi Lee Sperry, the many other internees, Lea Bowie and John Tewell who were so generous in sharing their stories and photos. Michelle and I at the Sams’ home after conducting our interview in 2005. They are featured in our film, “Victims of Circumstance”. I hope you found this article of interest and share it with your friends. This period is not well known in the annals of American and Philippine history yet it is so important for our younger generation to understand what happened seventy years ago and hopefully, prevent it from happening again. I’m pleased to offer this video I edited which captures the event of the liberation of Los Baños. Thank you so much for posting this. My Grandparents Cyril and Anna Brooks along with my father Ken Brooks and his 2 siblings Len and Rose were interned at Los Banos. Lou, this is a brilliant documentation of the camp ! The photos were taken by one of my fav. Carl Mydans of Life. Where did you obtain all of this info and images? Keep ’em coming my friend! Thanks Hank. I got the film and some of the images from the National Archives, the rest of the photos I gleaned from the internet and assorted sources. Wonderful article Lou. HELP!!! Two questions to anyone who may have answers: Did Ansi Lee Sperry also have a connection to Shanghai?? The name is SOOO familiar with a connection to my Dad, Floyd Rigg James and his connection to RCA Communications. Next… I wonder about a reference to Dr. Nance. 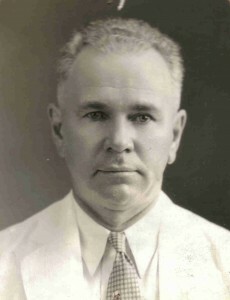 I was delivered by a Dr. Nance in Shanghai in 1940. I think my Dr. Nance had a different first name, but maybe they were related. I hate it when my mind trips up!!! Any comments will really be appreciated. Thanks, Lou, for the support you give. It is truly extraordinary!! Hi Leslie – yes, Ansi Lee was journalist William Donald’s secretary as he traveled throughout China. Look for her book “Running with the Tiger” by Ansie Lee Sperry, ©2009. Probably available thru Amazon.com. I don’t have much information on Dr. Nance. Perhaps some of the members of the FB Manila Nostalgia may know. Also try checking with Maurice Francis. I am the son and/or nephew of the three Dr. Nances who practiced in Shanghai before the war. Dana (my father) was a surgeon and probably would have done the delivery. Francis (“Frick”) was a pediatrician but may have done some deliveries. Keiser had left for the states by 1940. Dana was the physician at Los Banos. Well done Lou. Thanks to everyone who shared their stories and pictures. Thank you very much Lou for this wonderful work…honestly, i was watching it teary eyed…for the rescue and the retaliation afterwards…hopefully I could share this to distant relatives and friends in Los Banos and Bay in Laguna who lost relatives and entire families afterwards..
Nice to see Lea Bowie as an infant…really if God’s willed one to survive, whatever cirscumstances…one will survive! Another outstanding blog Louie! I am totally immersed in reading stories about the POW’s. I’ve always been intrigued because the friends that we grew up with were really too young to remember much, and their parents wouldn’t talk about it. It may have been because in the early 50’s the memories were still too raw. Thoroughly appreciated learning more about the rescue from Los Banos. Without your dedication, the Los Banos raid would continue to be a chapter in the history of WWII largely unnoticed by history. The raising of the flag on Iwo Jima overshadowed, and unfortunately continues to overshadow, one of the greatest behind the lines operations ever mounted. Had it not been attempted, over two thousand lives would surely have been lost to the massacre being planned by Konishi. In memory of my father, all the brave men American and Filipino who participated, and all the other internees, I thank-you for honoring this anniversary. You did it again, Lou. I saw the movie, The Great Raid, about the liberation of Los Baños. The movie ended as they walked out of the camp and into various means of transportation. What you did was to continue the story and tell what happened afterwards, which was a good thing to know. I had no idea the civilians were murdered so brutally in the barrios, nor that the mean Jap commandant went back to further torture and kill. I’m glad they hanged him. I’m fortunate to have the book, “Forbidden Family”, about the Sams. Thank you for all your efforts. They are much appreciated by all. I can not thank you enough for sending the link to this site and this post in particular. 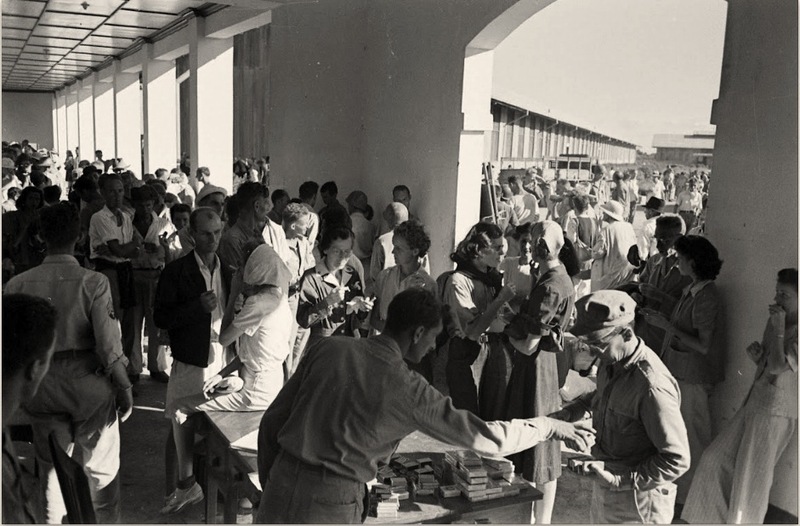 The information and photos portray the events and hardships endured by the internees and thankfully their release. My father being part of the 11th Airborne and I a current member of the 11th A/B Association, entitles me to a copy of the newspaper each quarter – in it is always a column called “News from Los Banos.” Believe me, I do not let any of my readers forget! Thank you for your kind comments. As a result of your suggestion, I have added a button to subscribe and be notified by email of future articles. Thanks so very much for this wonderful website. My dad Herman Beaber was interned at Los Banos . Unfortunately he passed in 2001 at the age of 93. He sure would have loved to see all these photos that you have posted here. I hope you don’t mind but I have linked to your website from my site that I created in my dad’s honor. Hi John, you were so lucky to have your dad for so long. I loved your website and I’m so pleased you included a link to my article. Thanks so much ! Thank you for this webpage, it was very interesting. My grandmother Lucy Palmer and her 2 sons, John and Ron were interned in Los Banos on their way from Shanghai to Australia. Ron was my father and John is my uncle & has many memories as a boy in the camp. This was forwarded to me by my mom who would tell us stories of the war. She started to cry after reading this as it brought back memories. She was a young girl hiding in the mountains in Baguio during the war. Life was bleak. 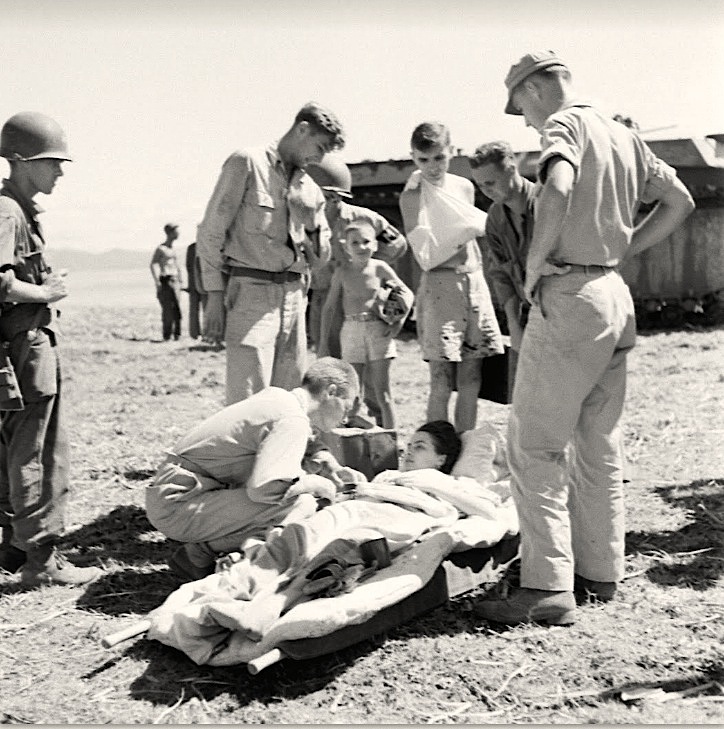 Her father was a filipino guerrilla and spy who survived the Bataan Death March only because the Japanese soldiers thought he was dead when he fell into a ditch so incredibly sick with dysentery. Thank you for this article and pictures. Hi Lou. Love the site. My grandmother was able to escape the carnage back then and was taking care of my mother who was just a child in those days. A very touch existence. Grandma passed in ’91 but she would have recognized the pictures. Also, I saw the entire series Ken Burns made about “The War” and it featured a family that was interned in Sto. Thomas. Never knew there were others that had civilians interned. Thank you for sharing. Just saw this! Excellent! Great job! Wish we had it at the internee reunion here in Sacto, April 24-26. Thank you for this. my aunt, Katherine Ellis Brown was at Los Banos and never really spoke about her experiences there except in a diary that she wrote while there. I hope there is someone out there who may remember her. she is deceased now and this is some. Sort of link. I am Lorraine Wagner and from the ELlis family. I have read that your aunt was at Los Banos. I am doing a blog of the Ellis family and would like to contact your family if interested. The blog is ellis1812.blogspot.com if you want to take a look. THanks. Thank you Lou for the time and trouble in creating such a detailed and interesting account, and for including the collection of good quality pictures – a lot of work. My father George Horridge (ICI China Ltd, dyestuffs division) departed Shanghai on the Anhwei, changed ship in Hong Kong for the Anshun but got caught in Manilla, he survived the war and typed a 5 page very factual account of his experiences (rations weight etc), available to anyone interested. He was taken to a base camp hospital about 12 miles from Manilla and “fattened up” about 30% had beri-beri in visible form. At the end (February) the rations were 200 grms per day with nothing except occasional sweet potato tops, an extra 100 grms offered for 5 hours work breaking up new earth for the gardens, about 150 took up the offer. Finally a heartfelt ‘thank you’ to the American and Filipino forces, the resistance movement, those individuals in the camps, and the Filipino population who sacrificed so much for freedom and justice. Frances Nance, your father was our physician at Los Banos. He treated my father for Beri Beri and did a bilateral radical mastectomy on my mother. Since there were no diagnostic tools available, the mastectomy was preventative. We liked and respected him very much. I was so engrossed in reading your interesting article. This is amazing and very heartwarming. The details are exceptional and well-reserached. I was born and raised in Los Baños, and still am residing there with my family. My father was a war veteran and we, his children, and his grandchildren would often hear him telling stories of how he participated in the war. I vividly recall him narrating to us what he did when the prisoners were brought to the Los Baños Interment Camp (Baker Hall). He was a young boy then, barely 20, and with his small frame, he could crawl under the wires and what-have-you and he would hand out some boiled sweet potatoes or cassava or bananas to the prisoners during night time. Then he would go around the forest trails to go back to the safehouse of the geurillas. He would later on involve himself in the fighting and eventually, during the liberation. My father fought and stood by his dedication and patriotism. It must have been a horrible experience for everyone who went through the worse possbile things under a sadist, brutal and heartless man. If my father was alive today, I would have let him read this or I would have read this to him and he would have enjoyed it to heaps. I could imagine him with his interruptions, every now and then, and telling us about his experiences during the war, while reading this article. I salute all the other unsung heroes of World War II. Thank you very much and God bless you richly. Thank you for this wonderful webpage and beautiful film. I teared up again and again seeing those prisoners free at last! My uncle and namesake Joseph A. Mulry S.J. died at Los Banos in January of 1945, just a month before liberation. This webpage honors his memory and all the prisoners of injustice. Thank you. A wonderful website. Wonderful to see my father and myself on your 7 minute video of our rescue. I looked for the rest of my family and friends but did not see them. So glad there is this documentation available. This is my first discovery of your website. My parents, Frank and Opal Mabry were civilian prisoners in Los Banos. My father was employed with a mahogany import company at the time. 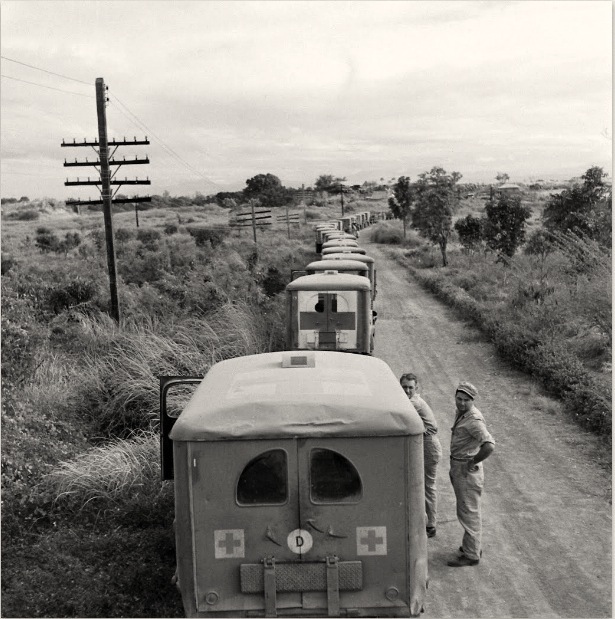 I have several books on the rescue and life in camp, but have never seen this many pictures. Thank you so much for letting us see this history. I am deeply appreciative of those who took part in this unique rescue. I recently completed listening to an audiobook titled Rescue at Los Banos by Bruce Henderson. I was riveted to this book always looking forward to listening on the drive for an hour each way to and from work everyday for a week. After finishing the book I couldn’t take my mind off about the dreadful experience the detainees spent during their captivity as told by the author. Going through these photos and the video I was able to relive the climax of their rescue by the 11th airborne paratroopers. Thank you for creating this site. My father, Robert Whitaker, was the older brother of Margaret. He was born in the Philippines and grew up there. He had left for college, and was an engineering student at the University of Washington, when the Japanese invaded. 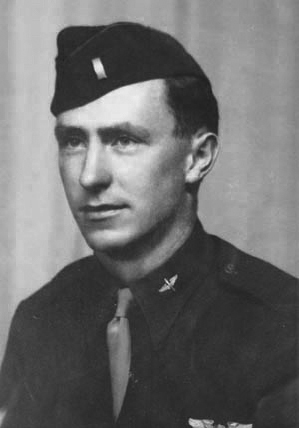 After the invasion he volunteered to join the Army-Air Force, and was stationed in the Pacific. He was the bombardier/navigator in a B 29 and flew 35 bombing missions over Tokyo. He didnt hear anything about or from his parents, Evalyn and Jock, or his sisters, Margaret and Betty, again until the war was over. My Mother, a brother and Grandmother were all three “guests” of the Japanese in Los Banos. Apparently, the Japanese left camp in early January, 1945 for fear the Americans were coming. 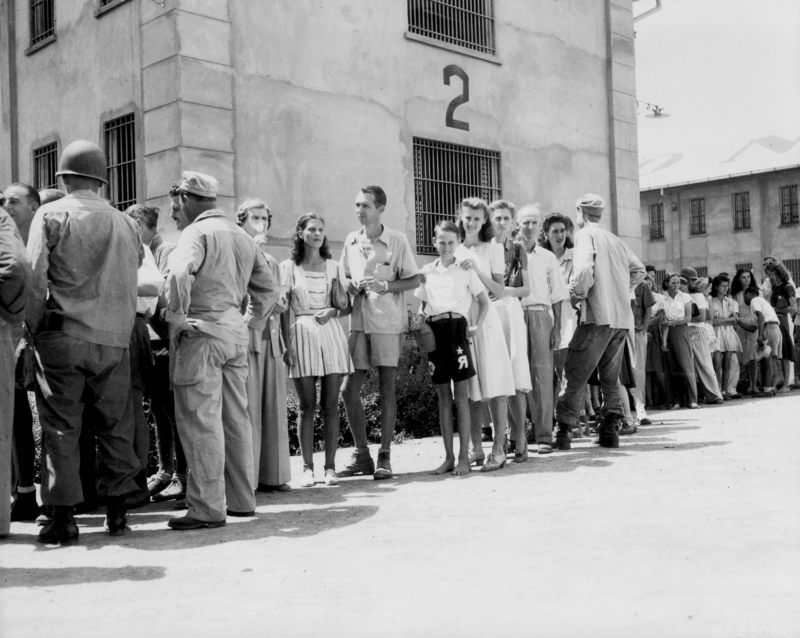 I understand there was great joy among the internees in their new found freedom, including the raising of American and British flags in the camp. Food stores were apparently broken in to. My dad, who has just celebrated his 93rd birthday, talks about being on one of the “ducks” as he calls them, and trying to load them up and get the people out of Los Banos. He talks about how quickly they had to move and how the people were bringing their few belongings along with them. He is very proud of what he and the others accomplished that day.